A quick update about what is the new outlet at the Curve! SAM’S Deli is now opened at The Curve, Mutiara Damansara. Well, it’s a spacious and modern deli which is located corner lot on the first floor of The Curve and directly above the Laundry Bar. You can choose to dine, catch up for a drink or snacks, online indoor or outdoor or organize meeting or parties at the lounge. The deli provides free wi-fi plus the outdoor setting concept is urban and equipped with big fans. SAM’S Deli @ The Curve is the 5th outlet after Paragon Mall, Gurney Penang, Seremban 2, Nu Sentral Kuala Lumpur and Encorp Strand Mall. 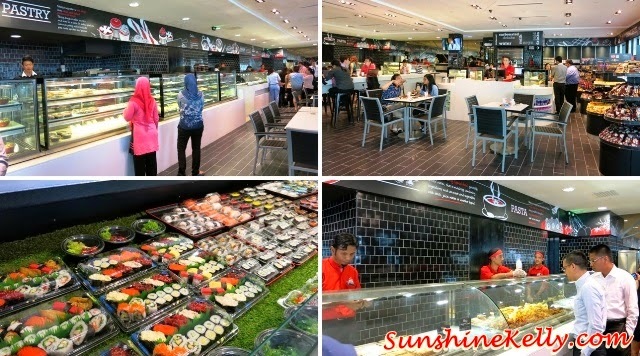 All the food and beverages served is Halal cuisine with a good selection of sushi, premium cakes, pastries, roast chicken, assorted potatoes, sandwiches, beef balls, lasagna, curry puff, nasi lemak and a lot more affordable food. yummy.. I wanna try their food .. Awful food. Undercooked chicken, mashed potatoes a slushy mess. Food served cold, service non-existent.